Yesterday, I noticed something peculiar while covering two separate stories on Facebook search and Facebook-owned Instagram: the accompanying videos were hosted on Vimeo. That’s odd. After all, it’s no secret Facebook has recently doubled up on challenging YouTube’s utter dominance in the market. In just a few months, it’s introduced 360-degree video, tested a pop-out video player, improved recognition of copyrighted content, enabled video profile avatars, added live-streaming capabilities and much more. It also spent an insane amount of money on Oculus last year to get the jump on virtual reality. So why embed Vimeo videos when it’s spent so much time building up its own platform? Facebook introduced 360-degree videos last month. More likely than not, it was just happenstance or some other innocuous reasoning by Facebook’s PR team, but it nonetheless got me thinking: Facebook should buy Vimeo. Facebook may have an ever-increasing number of video views, but that’s only because watching stuff on Facebook is convenient. One billion people use it every single day, and uploads autoplay on News Feeds, so high view counts aren’t exactly surprising. Truth is, people watch video on Facebook because they stumble upon it, because a friend shared something and it caught their eye in a cursory manner. No one goes to Facebook to find a specific video, to follow a series, or to discover new content. It feels like half of what’s on Facebook are YouTube re-uploads anyway. In other words, Facebook is where people who don’t care about video go to watch video. Enter Vimeo. It lies on completely the opposite end of the spectrum; if Facebook is for casual video watching and YouTube comprises a gamut of average joes and video producers looking to cash in, then Vimeo is the platform for the film-making elite. It doesn’t have the YouTube’s ginormous audience, but it’s where people who care about the quality uploads congregate – both in terms of compression and content. Take a quick look through Vimeo’s Staff Picks, and you’ll find short films, animated features, timelapses and more high quality goodies. Better yet, the commentators are a diametric counterpart to YouTube’s mess of people; as a whole, my experience is that they actually provide genuine compliments constructive criticism. On the internet! Vimeo’s Staff Picks are one of the best parts of the site. Facebook could benefit from that specificity, particular given there’s currently no central hub for its users to find and follow original, high quality content. Videos are too heavily tied to profiles and Pages, and there’s no easy way for people to upload content without tying it to their Facebook personas. You can’t even filter your search to only include videos. Vimeo would solve that problem, and in the meantime would obviously benefit from an expanded audience, and all of Facebook’s resources behind it. 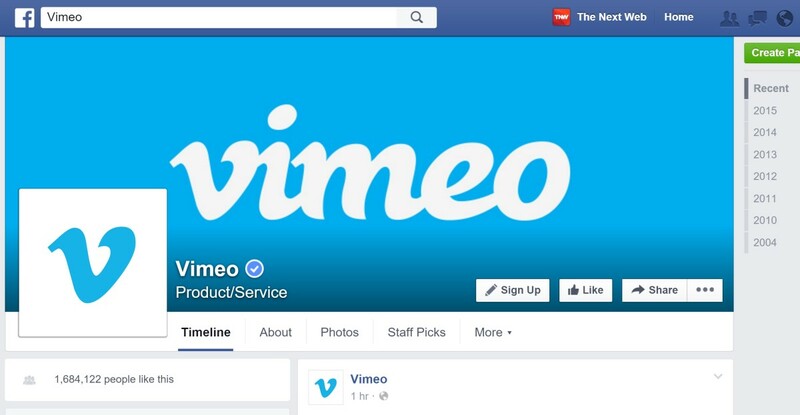 Vimeo has the community, but having a solid mound of money behind it couldn’t hurt. Of course, such an acquisition wouldn’t sit well with everyone – I can already hear some Vimeo creators groaning at idea. But Facebook has a surprisingly strong record of letting its big acquisitions operate with relative independence. Contrary to popular assumption, WhatsApp was never merged with Messenger, and sometimes I wish Instagram was actually more integrated with Facebook. It follows that Facebook doesn’t have to completely integrate Vimeo or host all user content there. Instead, Vimeo should remain a platform where people can find the good stuff: original videos with solid production quality, short films (and perhaps some feature length ones), and less compressed alternatives things like movie trailers and ads on YouTube. In my ideal world, Vimeo videos could be embedded onto Facebook’s News Feed natively, but they would be hosted on Vimeo.com. Meanwhile, your drunken shakycam videos would remain on your Facebook profile, unbeknownst to the rest of the Web. It’s all a little far-fetched, and there’s no indication Facebook has ever considered acquiring Vimeo, but that’s its best bet if it really wants to provide a suitable alternative to YouTube. Rather than trying to build its own video community from scratch, it could simply take advantage of arguably the strongest one around.